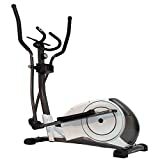 The ORBUS XT7 SPORT ELLIPTICAL CROSS TRAINER is one of the BEST EQUIPPED entry level Cross Trainers in the UK, representing FANTASTIC value and AMAZING levels of quality. With a SMOOTH DRIVE 12kg flywheel, it provides the home use enthusiast with all the tools required for any standard of fitness routine. The Orbus XT7 Trainer gives a smooth elliptical motion and great stability. Please do COMPARE ITS SIZE AND SPECIFICATION against other market leaders to see just what value this machine offers. . PRODUCT FEATURES INCLUDE…. Heavy Duty 12kg Flywheel, Dual action elliptical handlebars, Contact Heart Rate sensors, LCD Computer display, Forward and Reverse movement, Soft touch hand grips, Wheels for manoeuvrability, Maximum user weight 120Kgs, Full 12 month Home Use Manufactures Warranty, Low Impact Cardio Elliptical Trainer. Some assembly required.